It was the year that Joe DiMaggio set his 56-game hitting streak; Ted Williams batted .406; the Dodgers and the Yankees battled each other in a classic World Series; and America went to war. 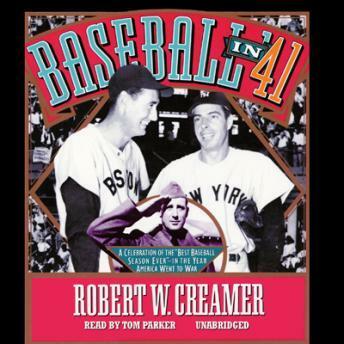 In this look at what he calls "the best baseball season ever," Robert Creamer skillfully intertwines these epochal moments in baseball with an informal history of a pivotal period in American life. Through it all, he recalls what it was like to be eighteen and a baseball fan when the game he loved vied for his attention with a looming war. Baseball in '41 makes us all remember why the game is still the purest representation of the American Dream.